This article is inspired by a reader question on a recent article about high-quality stocks. Many dividend growth investors seek high yields to go with high quality. 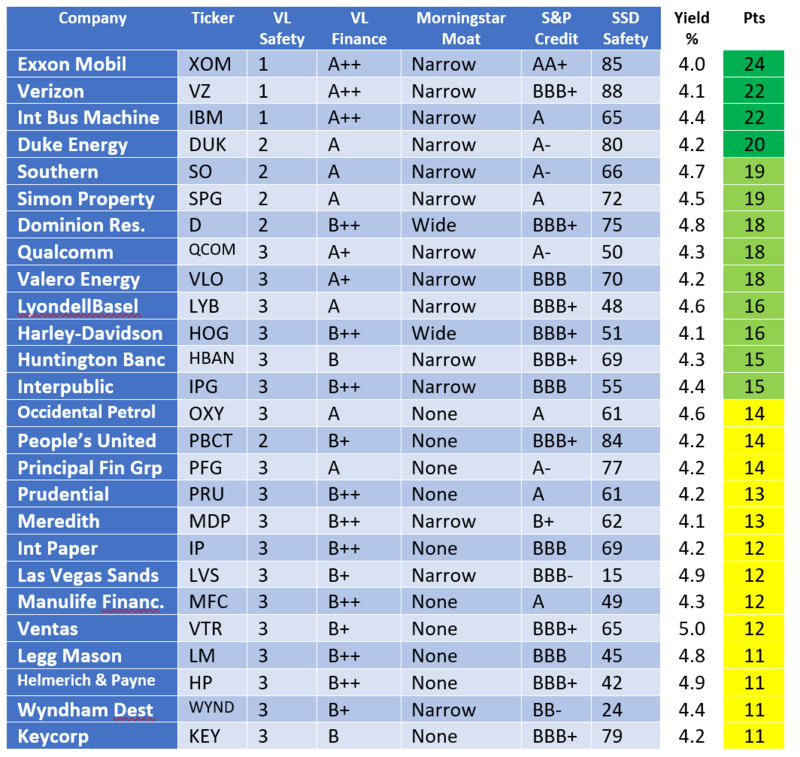 I rank quality for DG stocks yielding 4% or more. In the past two years, I have written two articles on high-quality dividend growth [DG] stocks (2018, 2019). The interest in this subject has been stunning. The two articles rank #1 and #2 on my most-read articles ever on Seeking Alpha, going back more than 10 years. There were a lot of low-yield stocks in those articles. Commenter UncleMilton asked whether it would be possible to rank the quality of 3%-6% yielding stocks. I thought that was an interesting suggestion. However, there are more than 300 such stocks according to the Dividend Champions spreadsheet [CCC]. I thought that is too much to bite off for one article, so I modified the range: This article ranks quality for DG stocks yielding 4% or more. I generally consider 4%+ to be "high yield," although I know that a lot of investors would require a higher yield for that designation. Anyway, higher yielders are here as well. There are infinite ways to define company quality, of course, but many investors utilize independent gauges of quality as part of their process. By "independent," I mean ratings from analysts who are not sell-side, and I exclude companies' characterizations of themselves. I'm interested in the opinions of outfits that sell information for a living; I believe that they have more incentive to try to be objective and avoid puffery. You will find descriptions of each provider's quality factors at the end of the article. To identify the highest-quality companies, I created a 0-5 point scoring system for each of the five factors. This is a change from the earlier articles, which I deliberately cut off at just very high-scoring stocks (by requiring 4-5 points on every factor). That will broaden the rankings quite a bit. My thinking is that readers of this article will be looking for high yield stocks first, then want to know their quality ratings, even if they're not very good. A few of the available rating systems don't translate one-to-one to my scoring system. For example, Morningstar only awards two kinds of moat (Wide and Narrow), and I couldn't see awarding any points for "None." So I give Wide 5 points, Narrow 4 points, and None gets 0 points. A stock can't get 3, 2, or 1 point for Moat. 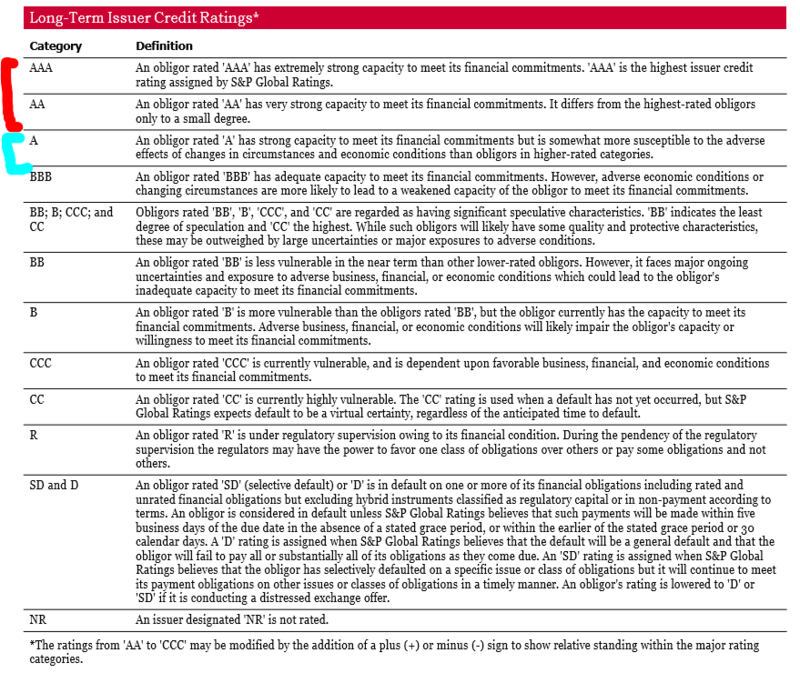 On credit ratings, I cut off awarding points at "investment grade" stocks under S&P's terminology. So a stock gets either 5, 4, 3, or 0 for its credit rating. The highest quality companies would get 5 points on every factor for a maximum score of 25. It turns out there are no such companies, although one got 24 points. In general, it appears that extremely high quality and high yields don't often go together. But there are still quite a few good-quality companies that yield more than 4%. I created separate tables for each yield range: 4-4.9%, 5-5.9%, and 6%+. Unfortunately, most of the companies on the CCC yielding more than 6% are not included in my Value Line subscription. I do not subscribe to the full service, and my local library does not offer it. Therefore the following coverage is limited to just a few stocks. There end up being just five high-yielding DG stocks that score in the highest quality category of 20-25 points. There are another 17 companies in the light green 15-19 category. Just for fun, I investigated CFRA's buy-hold-sell ratings on the five highest-ranking stocks. I was wondering whether any of them are decently valued (valuation is beyond the scope of this article). They have Buy ratings on IBM and AT&T, as their 12-month target prices are >10% above those stocks' current prices. I know there would be a lot of controversy around either of those two Buy ratings, but that's for another day, or maybe for this comment stream. Of course, perform further due diligence before investing in anything. Quality is only one of many factors to consider, and there are many ways to measure quality besides the ones used here. Other areas to investigate include the whole dividend picture, whether the company fits with your portfolio's function and your own personal goals, each company's business prospects, and of course valuation. Value Line is an independent subscription stock analytical service in business since 1931. The company has drawn kudos for the objectivity of its work. Its Safety Rank is one of several proprietary ratings. This is how it explains its top two categories, which are the only two levels used in this article. Rank 1 (Highest): These stocks, as a group, are the safest, most stable, and least risky investments relative to the Value Line universe. Rank 2 (Above Average): These stocks, as a group, are safer and less risky than most. …Stocks with high Safety ranks are often associated with large, financially sound companies, many of which regularly pay cash dividends; these same companies also often have somewhat more moderate growth prospects because their primary markets tend to be mature. The Value Line Financial Strength grade is a proprietary rating. In this article, I only used the top two levels to help find the strongest stocks. Quite a few ingredients go into Value Line's Financial Strength ratings. Balance sheet leverage, business risk, the level and direction of profits, cash flow, earned returns, cash, corporate size, and stock price, all contribute to a company's relative position on the scale. The amount of cash on hand, net of debt, is an important consideration…. For financial services providers, such as banks, thrifts, and insurance companies, the amount of capital, as measured by the equity to assets ratio, is a key consideration. More capital is better from a regulatory standpoint, but too much cuts down on profitability. Loss reserves are important, as well, as are funding sources. For lenders, deposits insured by the U.S. government represent a firmer source of liquidity than borrowings. It's when liquidity dries up that disruption occurs in the credit markets. It's important to note that financial strength doesn't always translate into stock market outperformance…But, for investors looking for dividend-paying stocks and stocks to hold on to for a long period of time, it pays to be aware of a company's financial standing. Morningstar's Economic Moat rating is a proprietary data point from Morningstar, which is another independent analytical firm that has been in business since 1984. "Economic moat" is a term Warren Buffett uses to describe the sustainability of a company's future economic profits…We see the primary differentiating factor among firms as how long they can hold competitors at bay. Only firms with economic moats-something inherent in their business model that rivals cannot easily replicate-can stave off competitive forces for a prolonged period. The prospect of earning above average returns on capital; and some competitive edge that prevents these returns from quickly eroding. Standard & Poor's bills itself as the world's foremost source of independent credit ratings. The company has existed as an independent financial analysis provider since 1941. S&P credit ratings are forward-looking opinions about the creditworthiness of an obligor. The opinions reflect S&P's view of the obligor's capacity and willingness to meet its financial commitments as they come due, and may assess terms, such as collateral security and subordination, which could affect ultimate payment in the event of default. Our scoring system turns over every stone. For example, off-balance sheet debt such as pension obligations is evaluated, forward-looking analyst estimates are reviewed to see if anything is changing for the worse, and industry-specific metrics are utilized when appropriate (such as funds from operations for REITs). We take our scores very seriously. Dividend Safety Scores are available for thousands of stocks, update daily using professional data feeds, and primarily change when new earnings reports are released. Scores are kept completely up-to-date to ensure you always have the most timely and accurate information in front of you. Per the legend below, scores range from 0 to 100. A score of 50 represents a borderline safe payout, but conservative investors are best off sticking with companies that score over 60 for Dividend Safety. A low score does not necessarily mean a dividend cut is imminent, but it indicates that the company possesses qualities that could ultimately jeopardize its payout in the future (and/or result in substantial capital losses). Disclosure: I am/we are long VZ, IBM, SO, QCOM, VTR, PM, T. I wrote this article myself, and it expresses my own opinions. I am not receiving compensation for it (other than from Seeking Alpha). I have no business relationship with any company whose stock is mentioned in this article.